The light boxes contain the two words, which are used in the animation GRID / AXIS. They can be seen as a starting point to reflect on our own perspective of how some memories are actually memories related to synthetic (artificially created) content. At this point it is possible to interpret the situation we are living in as science-fictional. Everything seems to be as 'usual', but the network, computer programs, databases and robotic machines change our perception and our way of organizing information and communications as well as most other parts of our society. 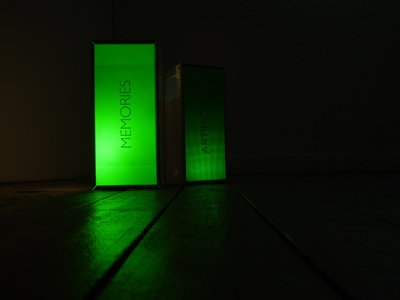 Many thanks to Arts Council England and Arena Gallery & Studios for making the ARTIFICIAL | MEMORIES exhibition possible from 10th - 25th October during Liverpool Biennial 2014.